The Football Association has allowed the use of 3G artificial pitches in every round of the FA Cup from 2014-15. 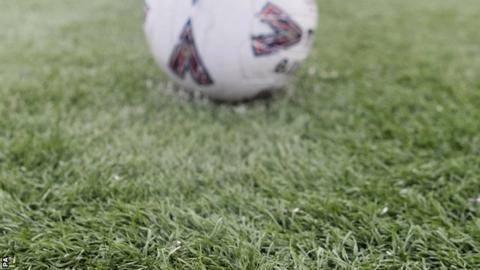 Synthetic pitches cannot be used after the first round proper under the FA's current rules. The decision to allow 3G ("third generation") surfaces from next season will be welcomed by clubs who rely on their more sustainable running costs. Artificial surfaces were outlawed from English professional football almost 20 years ago. "Clubs are increasingly seeing the benefits of using 3G surfaces across the football pyramid and clubs who play on those surfaces can now retain home advantage in the competition," FA general secretary Alex Horne said. "These pitches are a very useful asset and capable of delivering 50-plus hours per week as compared to a natural turf pitch, which can deliver perhaps five hours per week. "The value of 3G pitches has been clearly demonstrated during the recent wet weather where leagues within the grassroots game have migrated to them to address fixture backlogs." Plastic pitches were banned from English professional football in 1995 after four clubs - QPR, Luton Town, Oldham Athletic and Preston North End - tried them during the 1980s. They are currently commonplace in Europe and the possibility of their reintroduction in England has been raised recently by reformed Maidstone United's success on a 3G pitch in the Ryman League Premier. Maidstone are third in the division, but their pitch would be banned if they win promotion after Conference clubs voted against the reintroduction of artificial surfaces. Sport minister Helen Grant, member of parliament for Maidstone and The Weald, welcomed the FA's decision, adding that she is lobbying the Conference to change its rules on 3G pitches. "It's not just Maidstone United that might benefit from such a move," she said. "Smaller clubs up and down the country that already use these pitches would receive a boost, and I want to see more of them across our communities. "I have held initial discussions with the football authorities to consider a change of the rules and will have further meetings over the coming weeks."